Last I heard my granddaughter is still in hospital. Was able to keep down one spoonful of applesauce but was too nauseous for more. When discharged will need to go from hospital to a specialty nursing home that has a pneumonology specialty since she has pneumonia from aspirated vomitus. Raining today so I'm having second thoughts about the open days garden in a.m., then onward to Wave Hill in afternoon. At least yesterday's Garden State Sheep Breeders fleece and fiber show - 4 barns of sheep and yarn vendors - was merely overcast. Mistress Rose, when my daughter & son-in-law were in New Zealand they brought me back a pair of fingerless gloves for winter wear indoors. I'm sure you know the sort of thing. Like your yarn, they are a blend of possum wool, merino, and silk. Very soft. Gloves are involved but you could think about knitting yourself a pair of wristlets. I have knitted gloves, so that is no problem Jam Lady. In fact I have knitted all sorts and do socks for relaxation while watching TV. Glad your grand daughter is on the mend, and hope she is soon completely better. Pneumonia is nasty, but not quite as bad as sepsis, so hopefully that will go with antibiotics and good care. Your shows sound interesting. We did our final show of our current run yesterday. Didn't sell many things, but all were at least moderate priced, so not too bad in the end. I sold 3 besoms, so have to make more now as I have an order for 2. Thank you for the Questionaire MR. I will fill it in at some time in the near future but have to have more time available, ie i will need a whole session in the library and there is no guarantee I will get through it all. It is an in depth job, no question. I don't know what the fuss is about, there doesn't seem to be any options, apart from getting cold water showers! All I can see is piles of wood waiting till it rots before it is dry enough for the boffins to approve the burning! I have done an hour but got not far enough in the allowed time in the library. I hope your granddaughter is improving Jam Lady, and sorry to hear she was not well in the first place. I am a great believer in wristlets, the leather ones for support to the wrist, but they also keep that bit of the wrist warm so your hands don't need gloves to keep warm when you are doing a job. I have not seen any around the uk for a while. I used to wear them on the farm and in the timber yard for support but also for warmth! gloves are ok but they don't support your hands as well as wristlets do. Granddaughter is now discharged from hospital and is in specialty rehab center type of place. We are preparing for Thursday's hurricane - anticipated to make landfall some distance south and west of us in the Carolinas but heavy rain is expected here. Links to my entries for last weekends Garden State Sheep Breeders event. I hope you manage the questionnaire Gregotyn. It is a rather long thing, and does take some thinking about. I have filled it in personally, but we need to fill it in as a company, so I have made a whole page of notes on it. I am also trying to get other groups such as coppice groups to fill it in, and have alerted some of our outlets as well. Jam Lady, hope your grand daughter gets better quickly in the specialist facility. Good she is out of hospital now anyway. Stay safe in the storm Jam Lady. Managed a very mixed bag of products from the woods yesterday. I made a couple of besoms to deliver to one of our outlets today, picked up a couple of bags of sawdust for another, delivered some log sacks, and son delivered some charcoal. Today husband and son have log loads to do, so pretty mixed. Was talking to the farmer at the farm shop yesterday. He was repairing an interesting bit of equipment on the back of his tractor in the normal way-with a sledge hammer. It was a multipurpose thing that cut, turned, then rolled the ground, all in one pass. He said it conserved moisture. I learnt about 'dry farming' at school over 50 years ago, but it was said to be suitable for the US dust bowl, Africa etc. It has taken this long to get to the UK. We discussed that, but probably not needed in most years here as the problem is how to plough a swamp. Firstly I am pleased that your granddaughter is out of hospital Jam Lady, and hope that all goes well for her where she is now. Take care withe storms that I have heard are hitting the coast now from a fellow person here in the library. I liked the sheep at the show-I've done a bit of showing livestock, but mainly with pigs. I was going great guns for a while, then pressed the wrong button and it all went. Not all UK farms are impassible in winter, MR. I was a pigman for a few years on a 500 acre arable, sheep and pig farm. Mostly corn grown but also carrots, sugar beet and potatoes. There was never any problem getting on the land as it was very sandy. They kept the livestock mainly for the manure to save having to buy too much "bag" manure. In its hay days (no pun intended), the 30's to 60's they had pedigree sheep, cattle and pigs with all the rosettes on display in the appropriate buildings, and all because they wanted the manure! We could spread manure, harvest sugar beet, potatoes and carrots throughout the year if needed. I wanted to stay, but I went back to college. I had this idea that I could continue to work there and study! The farm was the first to make £1000 per acre in the country. A beautiful farm in a lovely setting all the old buildings were converted sympathetically to modern farming as it was in the 1960's/70's. I would have bought it if I could!!! I will set aside some time, MR, and ask for special dispensation to get more time in the library to do the questionaire tomorrow, but she probably won't allow, it rules is rules she will say! And I guess they will have a lot of folks in tomorrow, being Friday. I have looked at it but it would be better if I could download it, so as to peruse in my own time-read, I can't take it in as fast as I should be able to!. I may not make the morning as my dear mitzi motor has blown a break pipe which is most disconcerting when you are going down hill. I have chased my fitter last night and this morning, but to no avail till this afternoon about 2.30pm and he has diagnosed but not able to achieve, so I am hitting a former workmate who will do the job in the morning for me. When I said about getting the new one, he said "we make them"!! Other than that with the unexpected time at home I have been, tidying out sheds to make room for that which is to be put in the rubbish's place in the sheds-until it too becomes rubbish! I am a hoarder-well it might come in and lots of folks to me with the "I don't suppose you have a whatever it is?". What has surprised me was that my boss rang a farmer friend to see that I was ok, which I found quite touching, it is not a company that normally would care if you don't make it in, but then again I don't have a 'phone so I couldn't tell them anyway. The 'phone booth opposite me was removed some years ago. I may make the morning but don't know yet! We will have new neighbors. A very nice couple, children of our across-the-road neighbors, are going to downsize by building a new house now that their eldest is off to college. They've owned the land for some time. 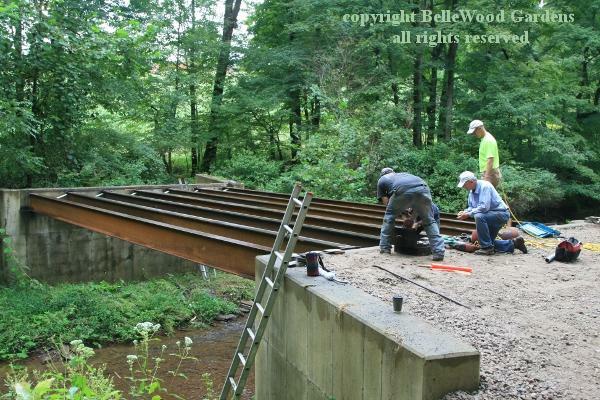 Having put in the footings several years ago - before the permit from the DEP for a creek crossing expired - today the I-beams for the bridge were installed. Mr Jam Lord and I got there about 30 minutes after the crane left the scene. 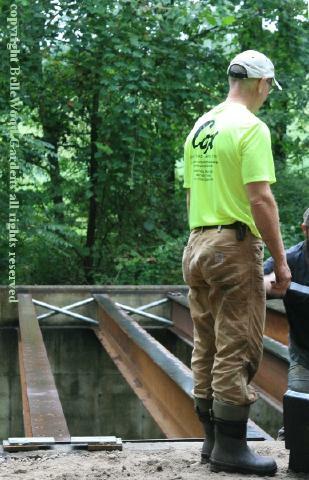 The deck itself will be 4 inch X 10 inch lumber, installed at right angles to the I-beams. Won't be any problem handling anything that needs to make a crossing. That really is some sort of heavy duty bridge, Jam Lady. They may be making a mistake however, children have a habit of coming back home when least wanted for an indefinite stay! I did, luckily my bedroom was still intact and much as I left it! Your neighbours should have made it into a drawbridge to keep the marauders out! Anyway I have made it to town with no brakes-well limited by using the 'pump the foot' method on the brake pedal, and selected engagement of the hand brake, but mainly using low gears for the downhills. I filled up with brake fluid before I started, which worked its way through to give better braking but as it was leaking all the time it didn't last too long, about a mile in 4 miles. The motor is now in the local repair workshop, for a new brake pipe which they make on site. At least it didn't go wrong in a nasty place and cause an accident. I have also delivered another load of kindling to the shop so that is a bonus, and bought lunch-in case the motor takes a long time. I am hoping to get back to the firewood sometime today, the orders are flying in at the moment, good job I have a reasonable amount of stock. The bridge is supposed to - in case of need - support a fire truck, Gregotyn. Have been away for a couple of nights and didn't take computer which is why I haven't been on line. Your brake pipe must have been a problem Gregotyn, so glad you got to the repair shop safely. Nice that your boss tried to find out if you were all right. That farm with the animals for manure sounds really lovely. I suppose they needed a lot on sandy soil too. Interesting bridge Jam Lady. Hope the new neighbours are going to work out all right, but I suppose you already know them quite well. Did you have any trouble with the hurricane rainstorms? You were a bit worried earlier in the week. We went to Dorchester Museum yesterday and had a look round. They are excavating some Roman remains, I think for an extension of the museum, and have found a road and some post holes from wooden buildings. Like Chichester, which isn't too far from where I live, every time you dig a hole, you find Roman remains. I was also very interested in the information about Thomas Hardy and William Barnes. Barnes wrote poetry in the Dorset dialect, the best known probably being Linden Lea. Came back through the New Forest today and got caught up in a cycle race which seemed to be meandering over most of the Forest and holding up everyone including the competitors as a result. They are lovely people, Mistress Rose. We've been to parties at their current home, which is not very far away. They have a farm with a delightful house, big wrap around porch, a couple of barns, boer goats, horses, chickens. When I had Chinese WWOOFers (one at a time, other WWOOFers inbetween) we'd go over there so they could sit on a horse, saddle blanket but no saddle, and someone would lead the horse around the paddock. The young woman was so thrilled, said she never thought she would get to ride a horse. And when I taught backyard chickens at the New York Botanical Garden they'd loan me a couple of placid hens (complete with cage, newspaper, scratch feed, etc) for show-and-tell - which the city people taking the class were absolutely fascinated with. They're very good people. Granddaughter is in rehab facility. Is throwing up again. Daughter says the place is not easy to deal with. Rock garden society chapter meeting at an arboretum today. Presenter gave a talk on attracting beneficial insects to your garden. After which I went to another arboretum on my way home, very quiet place with very few visitors. Got home and the young man from the local orchard had called. The Honeycrisp apples are ready and he had Stanley plums. So off I went and bought some of both, plus Gala apples. Mistress Rose, the storm first swung a little west and south. Moving very slowly. Some areas have already gotten 44 inches of rain, plus storm surges that have river flowing backwards. Storm will turn and come east and north, travelling over land. Should reach us sometime late Tuesday, with 2 inches of rain in the forecast. I hope your grand daughter is soon better Jam Lady. Sounds a difficult time for your daughter as well, and of course you. The neighbours sound a definite asset, so a good thing they are building there by the sounds of it. We get Gala apples, but haven't heard of Honeycrisp, so they must be a variety that does better with you. I think we a pretty well through the plum season, although there are still English Victorias around, but are now making our way through the early apples. I managed to get some English Coxes last week, so we must be onto the start of the main crop. Had Worcester and Early Windsor before that.